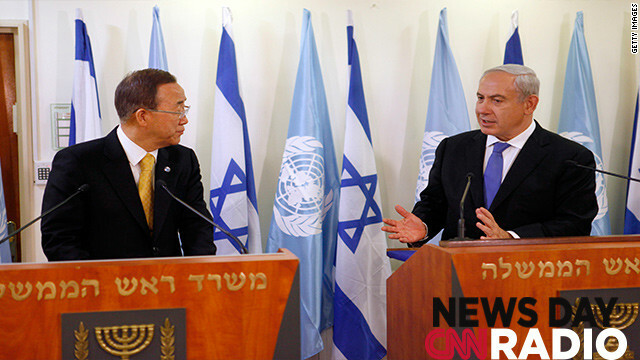 JERUSALEM, ISRAEL - NOVEMBER 20: United Nations Secretary-General Ban Ki-moon attends a press conference with Israeli Prime Minister Benjamin Netanyahu on November 20, 2012 in Jerusalem, Israel.
" I know how difficult the situation is here. But, Israel must exercise maximum restraint. I strongly caution against a ground operation which will only result in further tragedy." The Secretary General spoke in Israel today following a meeting with both Israeli President Shimon Peres and Israeli Prime Minister, Benjamin Netanyahu. "They have night vision equipment which is what allowed them to launch their offense at 4 a.m. this morning. They also have, for instance, 120 millimeter mortars, which they did not have not so long ago." Thanksgiving is a time when food shelters across the country put together turkey dinners for homeless Americans. But, programs that help fund soup kitchens and other services for the homeless may find themselves going off their own "fiscal cliff" if Congress fails to reach a budget deal before the end of the year. Advocates for the homeless say they have an additional problem: branding. "So, one of the consequences of homelessness being with us for now three-plus generations is that homelessness has lost its rank as a tragedy in this country", says Neil Donovan who runs the National Coalition for the Homeless. Subscribe to this podcast on iTunes or Stitcher. And listen to CNN News Day on our SoundCloud page. Why does Rwanda asked for DRC's problems.